Over the next few months, summer fêtes and annual galas will begin to dominate social calendars. Each year, hosts and organizations try to outdo themselves and create lavish, memorable events. Trends and themes are already emerging and becoming noticed by people in the event industry. One trend that has been increasing in popularity is incorporating more outdoor and natural elements into overall décor. Designers and planners are putting grand arrangements at the forefront, and constructing elaborate floral surprises for guests and spectators alike. Recently at the annual Daffodil Ball in Montreal, guests partook in a “Great Gatsby” themed event. Models dressed in 1920s attire greeted guests as they arrived to the venue, and breathtaking chandeliers floated above while crystal candelabras served as perfect centerpieces. 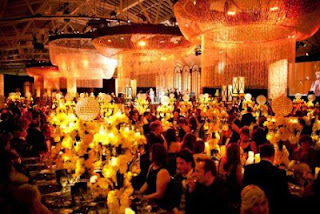 What tied the event together were the 50,000 daffodils that were scattered throughout the ballroom. The novel’s signature flower highlighted the evening’s theme and underscored the gala’s overall mission of supporting the Canadian Cancer Society. Each year, the number of daffodils typically increases; maybe next year they will be up to 75,000! At last month’s Metropolitan Museum Costume Institute Benefit, punk was the word. To coincide with the opening of the Costume Institute’s exhibition Punk: Chaos to Couture, the museum was transported back to the mid 1970s with bright colors, abstract prints, and countless safety pins. 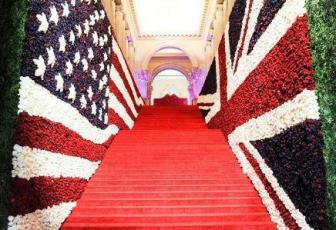 However, the showstopper was the grand staircase that led guests to the exhibition. Oversize American and British flags made entirely of 150,000 red, white, and blue roses flanked each side of the staircase, and immediately set the tone for the entire evening. Though not everyone can recreate extravagant displays at home, this trend can help inspire hosts and hostesses, especially during a tented event. 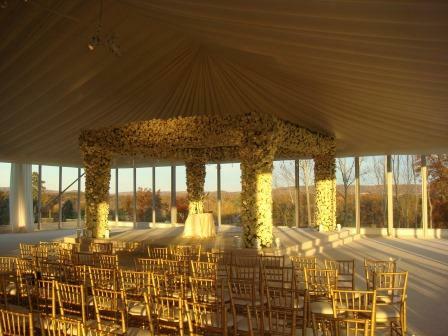 A white top or white walled marquee offers planners a world of possibilities. With a blank canvas, flowers can add flashes of vibrant color against the white background and help set the mood. Alternatively, if you decide on a clear top or clear sidewalls, the line between inside and out becomes almost nonexistent. Guests can enjoy sitting in a floral setting while watching a brilliant sunset or appreciating a star-filled evening. Either tenting option ensures that your event will be a success no matter what Mother Nature has in mind. When you start planning your next event, consider including an eye-catching arrangement that will truly amaze everyone attending. Your friends and guests will be awe in of your styling and decorating abilities! Thank you to Barbara Esses,Preston Bailey, Decor & More Inc., and Raul Avila Inc. for these wonderful displays!